Want to turn your next fundraiser into a really “cool” event? JoeShade® portable sun shade umbrella, a truly special product for your special event! The sturdy nylon umbrella blocks harmful UV rays and is supported by a powder-coated metal tripod base for extra stability. Its carrying bag has a convenient shoulder strap, making it easy to carry with you wherever you want to take it. 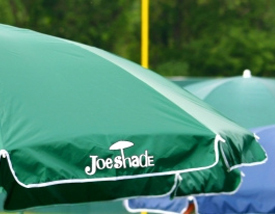 Order your JoeShade umbrella today and “stay cool” at your next event!